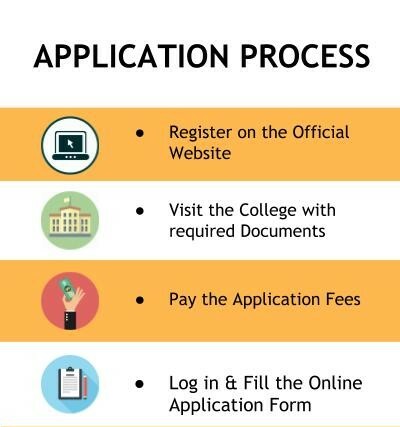 The application can be made online for NIET, Noida on their official website. They must verify their Email to be registered. The college representatives will get in touch with the applicants. The applicants must visit the campus to meet the counsellors. They must also carry the required documents with them. After the counsellor shortlists the applicants, they can pay the application fee at the admission counter. After payment of fees, the candidate can log in with their registered Email ID to complete the form. The entrance exam UPSEE must be attempted and cleared. 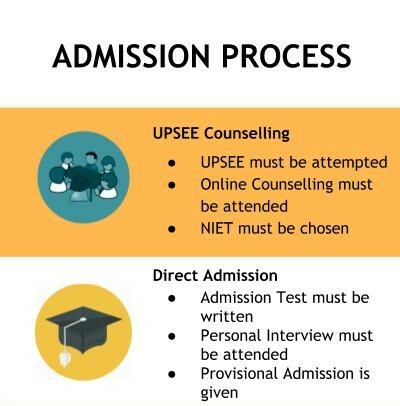 The online counselling for UPSEE 2019 must be attended. NIET must be chosen in the counselling. The admission test by the college must be written. The eligible candidates receive an admission notification from the Registrar Office. After verification of eligibility, the candidate will receive a Registration Form for provisional admission after the admission fee payment. Admission Committee of Dr APJ Abdul Kalam Technical University, Lucknow conducts admission for B.Pharm and M.Pharm in a combined admission test. The test will be conducted in the month of May / June. For NIET, Noida admissions 2019, the minimum requirement is to have 45% aggregate marks in 10+2 from a recognized board of education. For students from reserved categories, the minimum marks required is 40%. The candidates must have appeared and qualified in UPSEE. For Direct Admissions, the candidates must have scored a minimum of 60% aggregate marks. 10+2 with 45% aggregate marks from a recognized board of education with Physics & Mathematics and Chemistry / Biotechnology / Biology / Technical or Vocational subject. Must have a rank in UPSEE. 10+2 with 45% aggregate marks from a recognized board of education with Physics & Mathematics / Biology and Chemistry / Biotechnology / Technical or Vocational subject. Must have a rank in UPSEE. The minimum eligibility requirement is to have completed a Diploma in Engineering from any institute in UP or to have completed B.Sc with Mathematics from a recognized University with 45% aggregate marks. Reserved category students get a relaxation of 5%. Admissions through UPSEE / UPTU requires the students to have secured 45% aggregate marks in a Bachelor's degree of minimum three years duration. A relation of 5% is given to students from reserved categories. Direct admissions require a minimum aggregate of 60% in Bachelor's degree. For Direct Admissions, the minimum required marks are 50% in Bachelor's degree with scores in CAT / MAT / XAT / CMAT / GMAT. Work experience is given preference. B.Pharm admissions to NIET requires the students to have secured a minimum of 50% aggregate marks in 10+2 from a recognized Board of Education. The candidates must have studied Physics, Chemistry and Mathematics / Biology in +2. They must have qualified in UPSEE. Those who have finished Diploma in Pharmacy with 50% aggregate marks from a recognized Institution are eligible for admission. 45% in case of reserved category students. Those who apply through UPSEE must have secured 45% aggregate marks (40% for reserved category students) from a recognized University in any Bachelor's Degree. Direct Admissions to MCA requires the candidate to have secured 50% aggregate marks (40% for reserved category students) in any Bachelor's degree of three years duration from a recognized University. They must have studied Mathematics at 10+2 and Graduation level. The applicants are required to have scored 60% aggregate marks in BE / B.Tech from a recognized University to be eligible for M.Tech courses. BE / B.Tech in the relevant discipline or MCA with 60% aggregate marks from a recognized University. BE / B.Tech in the relevant discipline with 60% aggregate marks from a recognized University. The candidates applying to PGDM must have secured a minimum of 50% aggregate marks in Graduate degree from a recognized University. They must appear and qualified in CAT / MAT / XAT / CMAT / GMAT. Preference is given to candidates with work experience or additional educational qualification. 75% marks are compulsory for taking admission in B.Tech. There are No Entrance exams required if you are a citizen of any other state except up only 2 aptitudes and 1 subjective exam of maths are given by me which is held in college and after this these people take an interview and if you are passed then easily you get into this college. Minimum 60% is enough to apply in NIET. With a subject of PCM, The rules are too tight for a student, Even one class miss can back u for the 3-day course. Only some teacher, are good. Most of them, Are not, Too good, But this College, give one a better placement than any, Other, The Lab teacher is far better than class teacher. 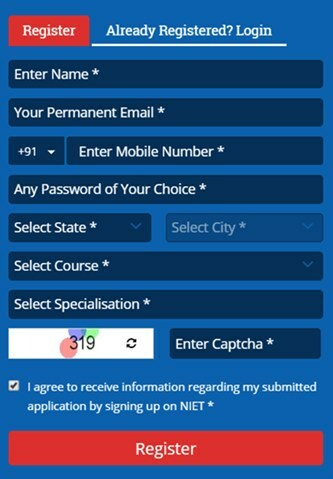 Individuals who wish to enrol to Noida Institute of Engineering and Technology, [NIET] Noida can use the means of going through UPSEE and JEE Mains. I took UPSEE Entrance Examination with a rank of around 29,500. Cut-offs at Noida Institute of Engineering and Technology, [NIET] Noida range from 7,000 - 40,000 in UPSEE for Mechanical stream. I have taken admission in Noida Institute of Engineering and Technology. I took admission by UPSEE councilling. I had given the entrance exam of UPSEE and got 18000(GN) rank and 5500(OBC) rank. The eligibility criteria are you should 60% or above in 12th-grade. The typical cutoff for computer science stream starts from 15000 onwards to 30000 rank in UPSEE exam. The Eligibility criteria is a CBSE board student should have 70℅ above and for other boards it is 80℅ for admission. Two tests will be taken if you're going for the management quota: one will be computer based and other will be hand made test of maths questions. The eligibility criteria in Noida Institute of Engineering and Technology, [NIET] Noida are same as per the AKTU university norms. The entrance exam is conducted in the month of Aprill. But there is also a direct entry seat through college for which college can be contacted. The Entrance to NIET will have to have 70% in the 12th Grade and cleared the entrance test organized by them. The Cut-Offs are 105 out of 360 for the JEE Mains. The eligibility criteria and admission procedure: The JEE/UPTU entrance exam have to be cracked and the cutoffs vary every year or you can also take admissions by showing your percentage of your 12 class and the percentage must above 60%. In the Noida Institute of Engineering and Technology the eligibility criteria is garduate BCA/B.SC/B.COM/BA AND 10+2 math is mandatory. Best college of UPTU 5 RANK IN UP AND 1st RANK IN GREATER NOIDA KNOWLEDGE PARK. The criteria were 50% and above marks in 12th and the admission procedure was based on a test of 30 minutes. I have appeared for UPTU entrance exam and the Cutoff is above 45% in PCM in 12th class for mechanical engineering. I had qualified for the NIET entrance exam, then I got selected for B.Tech admission in NIET, Greater Noida. There are no such eligibility criteria for admission. No cutoffs, no entrance exams only donation works in this college. 60% marks in 12th Board as PCM is required. I have written JEE MAIN entrance exam to get the admission. The eligibility criteria and admission procedure for my course is to have 85% of marks . I have appeared for JEE MAIN entrance exam and the cut off was 65% in the 12th class. You will have to clear UPTU exam or JEE MAIN exam to get admission. I don't know about the entrance exam. I got my admission through management quota. The student needs to qualify UPTU entrance exam. Admission is done on the basis of UPTU entrance exam. What is the admission procedure and fees structure for B.Tech? Hi, please tell me the admission procedure and fee structure for B.Tech. Bachelor of technology INR 90200/- per year. Any one of the following optional subjects: Chemistry, Bio-Technology, Computer Science or Biology. Students appearing in the qualifying examination are also eligible for admission subject to the fulfillment of the requirements of education, age and physical fitness etc. as prescribed by the examining body during counseling /admission. Candidates who have passed Diploma (with minimum 60% marks) recognized by the U.P. Board of Technical Education in any branch of Engineering/Technology are eligible for admission to Second year in any branch of Engineering/Technology. Admissions for B. Tech. are conducted by Admission Committee through admission tests. Combined Admission Tests are conducted each year, in the month of May/June by bodies appointed by the government. These tests are called SEE UPTU for admission to B.Tech. The vacant seats are filled through direct admission on the basis of marks obtained in the 10+2 examination in accordance with directions of the State Government. Diploma holders having 60% marks are eligible for direct admission to second year. and through counselling by UPTU. You can download form from official website or Application form can be obtained from the Institute by paying Rs. 1000/- in cash from Registrar's Office or by sending DD in favour NIET. Greater Noida.